Bodhisattva is the goddess of mercy and compassion known in Japan as Kannon (‘one who hears the sound of the world’) and in China as Guanyin. Depicted here is the origin of Kannon in India as Avalokitesvara. Kannon is sitting on a rocky island in the Southern Sea off the coast of India called Potalaka, a place she lived on earth. 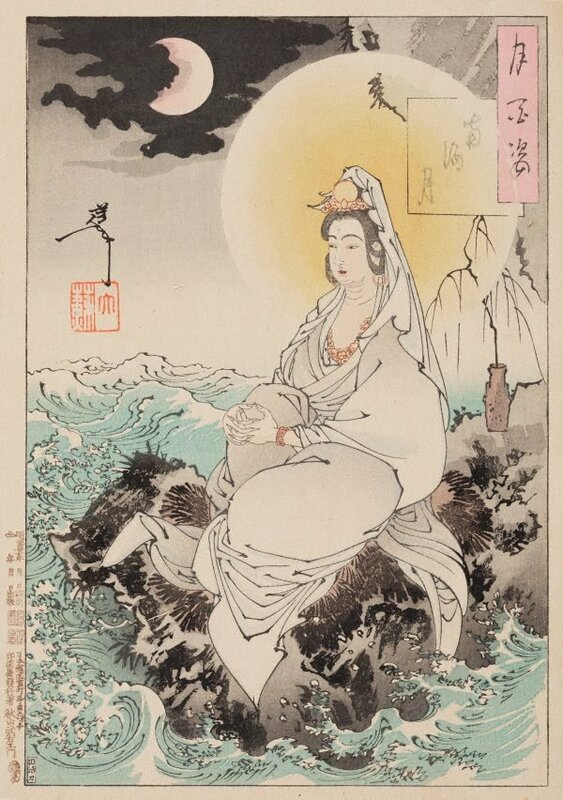 She is sitting under the moon on this rocky outpost, and behind her is a vase with healing water and a willow branch, which she would use to sprinkle the water over people in need. Kannon is particularly worshipped by fishermen and sailors.